One of the Highest Concentrations of HA Available! With 300 mg of HA per ounce, Effortless HA has one of the highest concentrations of HA available, in a readily available liquid. 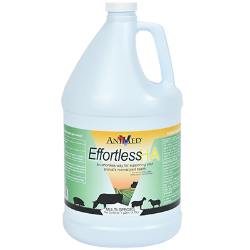 Effortless HA offers an effortless way for supporting your horse’s normal joint health! One gallon is a 256-day supply at the maintenance level dosage. Comes with pump applicator.